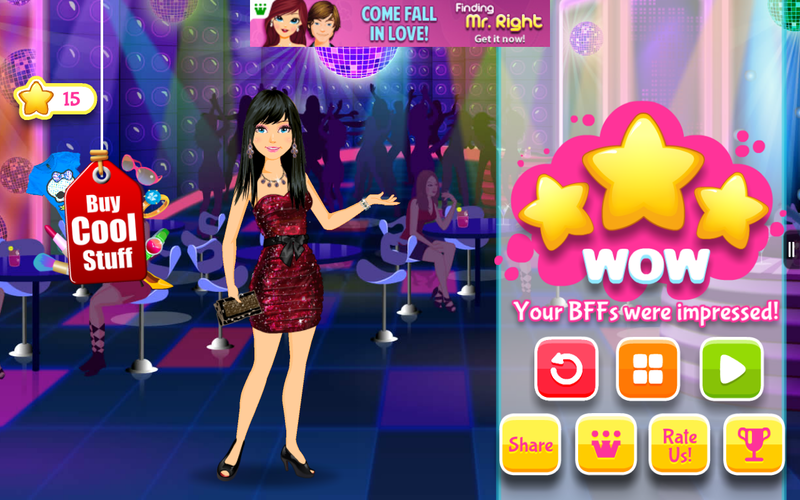 Intro: BFF High School Fashion is a game created by Games2win for anyone who loves fashion. It’s a dress-up game with a twist in the tale. You make three BFFs in the beginning that lead you to various events and parties, testing your fashion sense at every turn. The amount of dresses and accessories took me by surprise as every level had a new theme, AND a new dress! With 85 levels and tons of dress-up items, this is one really colorful ride. On starting the game for the first time, Natalie introduces me to who is who and what is what. I am supposed to get ready for various events but I also have all my three BFFs just a tap away, in case I am stuck. The first thing I did was see all the level names. Pretty cool I must say. From a simple Beach party, to a much cooler Sci-fi meet-up. There is also Bollywood night, a Zombie Evening, a Safari expedition and a lot lot more. Things to watch out for: wrong accessory, wrong bag and wrong shoes. I had the toughest time getting it right. Clothes are pretty much a no brainer, if you have read what event you are going to. The game progression too is pretty easy, unless you are very bad with styling. But again, you have your BFFs right around the corner, to help you out. And there is my character…looking gorgeous best! Love the simple, linear story line. Dresses up games like these don’t need heavy story lines to confuse the player. I also loved the fresh levels with lots and lots of styling to be done. Psst…I am actually hooked on to it and want to see what the Sci-fi theme looks like! I seriously think the number of free Hints should be 10. 5 is too little for someone like me. BFF High School Fashion is a perfect mix of fashion and engaging gameplay. It is fun, it is light and looks awesomely cool. Say, it’s almost close to Covette Fashion. But not quite there. However, it is much better than any other fashion BFF game out there. BFF High School Fashion actually takes you on colorful journey through the teenage wonder years.